As Norfolk Southern begins to wrap up completion of its Heartland Corridor project, we will shut down train operations between Williamson, West Virginia and Portsmouth, Ohio for 72 hours beginning 2:00 AM, Sunday, August 29. Trains normally operating over this route will be rerouted via alternate routes. Customers with shipments normally operating over this route may therefore experience delays of up to 24 hours. TWO NEW MAZES FOR 2010! Received the following via email. The email included a coupon worth $5 off each ticket. For various reasons I cannot duplicate the coupon here. I suggest you sign up for the mailing list as per our posting of Wed., Aug. 18, 2010, Delaware River Railroad Excursions. $5.00 off each Winery Train ticket. Tickets must be purchased in person at the ticket booth. One coupon good for each order of tickets. Offer good only August 28th & 29th 2010. Its going to be a beautiful weekend, perfect for a trip on the Winery Train. Bring this email to the ticket booth and we will take $5.00 off for each ticket you purchase in person, the day of the ride! Trains leave Phillipsburg at 11:00 AM. NORFOLK, VA. - Earlier this week lead state Pennsylvania, joined by Alabama, Virginia, Tennessee, Mississippi, and North Carolina, applied for federal money under the TIGER II Discretionary Grant program administered by the U.S. Department of Transportation. The application seeks $109.2 million in support of new and expanded independent intermodal facilities in Harrisburg and Philadelphia, Pa., and Charlotte, N.C., along with track and signal improvements in Alabama, Tennessee, and Virginia. "On behalf of Norfolk Southern, I commend and thank our partners for their recognition of the value the Crescent Corridor offers their states," said CEO Wick Moorman. "The Crescent Corridor Program is a tremendous economic advantage for the 15 states directly affected and the U.S. as a whole. It will create jobs and generate business growth, while delivering substantial public benefits for communities and customers. Governors Ed Rendell, Bob Riley, Bob McDonnell, Phil Bredesen, Haley Barbour, and Bev Perdue are national leaders in demonstrating how public-private partnerships can create safe, practical, green improvements to America's transportation infrastructure." The Crescent Corridor program of projects is estimated to cost $2.5 billion for full development. Crescent Corridor projects currently planned for development include new independent intermodal facilities at Birmingham, Ala., Charlotte, N.C., Memphis, Tenn., and Franklin County, Pa.; the expansion of intermodal terminals in Harrisburg and Philadelphia, Pa.; and the addition of freight rail capacity in Virginia and Mississippi. In addition to facility investments, the program includes significant investments in rail route improvements consisting of additional passing tracks, double track projects, improved signaling systems and other track speed enhancements. According to the six partner states in their TIGER II application, "The Crescent Corridor Program is one of the most attractive projects in the USDOT's infrastructure portfolio due to its modest cost, the speed at which it can be built, the significant annual return on investment, and the widespread support it has at all levels of government and as well from the private sector." For more information about the Crescent Corridor Intermodal Freight Program of Projects, visit www.TheFutureNeedsUs.com. NORFOLK, VA. - Norfolk Southern Corporation CEO Wick Moorman and Executive Vice President Finance and CFO James A. Squires will participate in two upcoming transportation conferences. Wednesday, Sept. 8, 2010: Moorman will address the Dahlman Rose Annual Global Transportation Conference in New York City at 11:30 a.m. EDT. Interested investors can listen to a simultaneous webcast at http://www.wsw.com/webcast/dahlman5/nsc/. Thursday, Sept. 9, 2010: Squires will address the Credit Suisse 2010 Automotive & Transportation Conference in New York City at 7:45 a.m. EDT. Interested investors can listen to a simultaneous webcast at http://cc.talkpoint.com/cred001/090810a_rb/?entity=1_8M3KXNR. This year's road trip through Kentucky, I came upon some interesting RR'ing sights to share with you. So sit back in my car's rear seat, make sure your seat belt is buckled as we drive over Kentucky's roads. The first stop was in Bardstown. 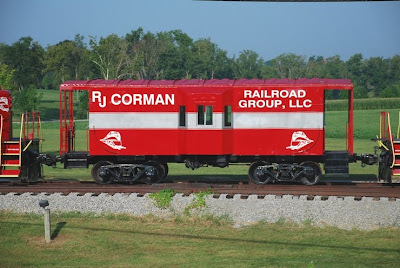 I first noticed R.J. Corman's three very clean red and silver diesels and one caboose parked next to a neatly stack used railroad ties that were advertised as being for sale. 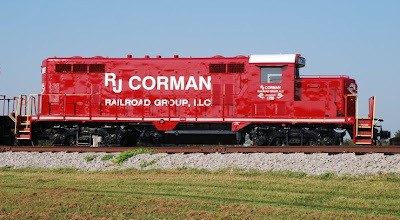 All four pieces of equipment looked as though they just come out of the paint shop.RJ Corman 1738 is an ex-CSX EMD GP16 that has since been retired. The caboose's heritage is of unknown heritage. In Louisville, spotted a CSX mixed freight utilizing their trackage rights on the Louisville & Indiana (LIRC) bridge on Monday ((August 9th). The bridge's heritage is ex-PRR, ex-PC and ex-CR. We also took some out to turn our attention to visiting some of the railroad museums we came across. Bowling Green's Railpark Train Museum was on our itinerary thanks to my wife who came upon one of their brochures earlier in our travels. 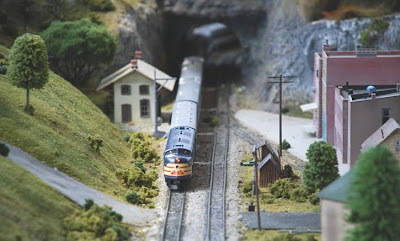 The HO layout they had on display was very well done. Visiting such sites can also serve as a source for new ideas for one's personal layout. I was also hoping to see the Kentucky Railway Museum in New Haven (KY). Alas, May flooding in this area had unfortunately damaged the layout and closed it when we where there. Outside of their museum was parked the ex-Santa Fe CF7 and three coaches that are used on their excursions. Thanks for joining us on this trip and hoped the car's back seat didn't prove to be too uncomfortable! RICHMOND, VA. - A critical choke point on Norfolk Southern's Crescent Corridor has been eliminated with a reconfigured rail junction near Front Royal, Va. This was the final and most complex of six capacity improvement projects in Northern Virginia to handle more trains at higher speeds. Funded by $43 million from the Virginia Department of Rail and Public Transportation (DRPT) and nearly $20 million from Norfolk Southern, the projects lengthened or built new passing tracks between Manassas, Va., and Front Royal, installed five miles of double track near the Virginia Inland Port, improved signal and traffic control systems, and increased train speeds through Riverton Junction near Front Royal. "The completion of these I-81 corridor improvements will benefit both freight and passenger rail service in Virginia," said DRPT Director Thelma Drake. "This capacity will attract more trucks from the highways to trains, as well as facilitate future passenger expansion in Northern Virginia." "With these improvements, we can move more trains faster through Northern Virginia," said John Friedmann, Norfolk Southern vice president Strategic Planning. "This is a significant milestone in increasing the freight capacity of the Crescent Corridor in Virginia, and a prime example of a successful public-private partnership at work." The Crescent Corridor initiative supports the Commonwealth's goals for improving freight transportation in Virginia while facilitating passenger improvements. The Crescent Corridor consists of a program of improvements to infrastructure and other facilities geared toward creating a seamless, high-capacity Intermodal route spanning 11 states from New Jersey to Louisiana and offering truck-competitive service along several major interstate highway corridors, including I-81, I-85, I-20, I-40, I-59, and I-75. More than $2 billion in projects have been identified to improve freight rail service and reduce interstate highway congestion. The Virginia Department of Rail and Public Transportation (DRPT) is the state agency for rail, transit and commuter services in Virginia. DRPT's mission is to improve mobility and expand transportation choices in Virginia. Periodically we get emails about special events on the Delaware River Railroad Excursions out of Phillipsburg, NJ. Because these emails are highly formatted (fancy), posting them on this blog is time consuming and not a simple task. Also these email often contain discount coupons, which I cannot post. If you want to know about the special events in a timely manner and receive the discount coupons, I recommend you join the mailing list. Here is the link. Posted below are two examples of information we received recently about special events, minus the discount coupons. Each group receives a map of the maze. We actually have a small and a large maze. Depending on your skill level and the amount of time you have you can do either one or both! In the maze there are 12 checkpoints and 12 check boxes to be checked off. As you find each check point there is a hole puncher at the check point. The game is complete when each check point is checked off and you find your way out of the maze! On site we have a beautiful picnic grove so feel free to bring your lunch and spend the afternoon. You can arrive on any train you like and stay as long as you like. Received the following information via email. 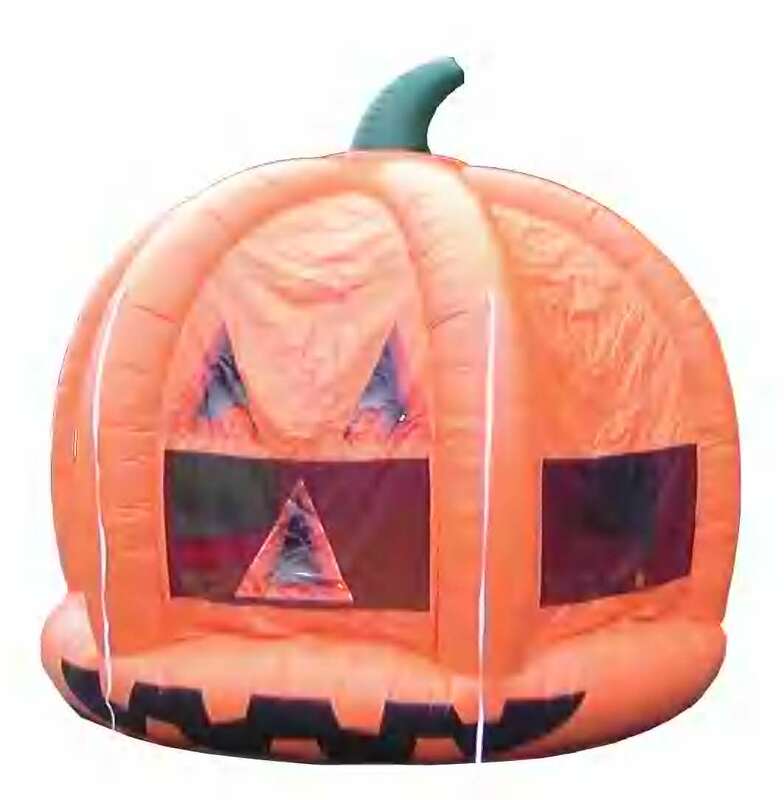 Click on picture to see it enlarged; then use your BACK button to return here. Our Polar Express Train Ride departs on weekend in December from Lehigh Junction located in the Historic Main Street area of Phillipsburg New Jersey. 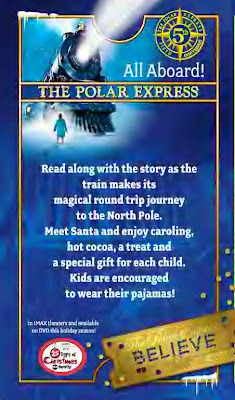 On the train you will re-live the experience of the little boy in The Polar Express©, written by Chris Van Allsburg and published by the Houghton Mifflin Company. The story focuses on a little boy who has been told by his friends that there is no Santa Claus. Unwilling to believe this, he lies awake in his bed on Christmas Eve, waiting for the sound of Santa's sleigh. Instead, he hears the hissing steam and squeaking metal of the Polar Express as it stops outside his window, ready to take him and other children to the North Pole. During your ride you will listen to this wonderful story, every child will be served hot chocolate and cookies and visit with Santa. Every child will receive a very special bell from Santa. Only those who believe can hear the sound of Santa's sleigh bell, can you? Our trips leave 2:00 PM, 4:00 PM 6:00PM & 8:00 PM on Sat and 2:00 PM, 4:00 and 6:00PM on Sunday! All trips will be pulled by our historic antique diesel locomotive #8159 and consists of antique restored passenger cars from the 1950's. Following article is from the Pocono Record dated Friday, 7-30-10. Onlookers gathered Thursday as word spread of the demolition of the historic Dansbury Depot. Occasionally children and teens accompanied by adults stopped to pose for a final photo in front of the East Stroudsburg landmark. Heavy equipment appeared at the depot Wednesday night, just hours after a county judge dismissed a legal challenge to the razing. Demolition work began Thursday morning. People watched as a yellow backhoe gouged into walls and crunched away at the dining room roof, which was built in 1980. Workers paused to wrap a chain around a decorative iron archway, gingerly tug it from the ground and place it away from demolition debris. Even as the demolition was under way, preservationists pleaded for a way to save it. The depot may not be doomed yet. Supporters say a plan is in the works to move the 1864-built portion of the depot across the tracks. It will happen only if a funding source can be identified. Answers on that could come today. Part of the building would be placed on a grassy area owned by the borough and possibly used as an office. Funding won't come from the borough. Council President Roger DeLarco says the entire borough budget is around $850,000, which is close to the amount the developer had mentioned as a possible selling price. That amount does not include restoration. The former train station was converted into a restaurant and placed on the National Register of Historical Places in the 1980s. It was gutted by fire in October and was too costly to refurbish. Developer Troy Nauman plans to build a three- or four-story building in the Crystal Street space. It will have commercial space, probably a restaurant, on the ground level and apartments above. A crowd of about 70 people from East Stroudsburg and surrounding municipalities crammed into the borough council committee work session Thursday with questions about council procedure. They wanted to know how action toward the redevelopment of the Dansbury Depot moved so quickly through the government process without the public being aware of it. Someone called for borough code enforcement officer John Blick to be removed for signing the demolition permit. The comment got hearty applause. Council repeatedly explained the depot is private property and they followed proper procedures. The demolition has stimulated business on Crystal Street. One store is selling "demo dogs" (hot dogs) for $1.25 and reports plenty of takers. Parking was scarce Thursday, and cars cruised down the street with windows open and cameras clicking. Received the following email from Kermit Geary, Jr. about a recent railfan trip. Because he has so many pictures to share, he posted them on Facebook. Link to his Facebook page is below. Greetings all: Took a break from all the medical doctors and house repairs to go with three good friends, Nick Marokovits, Jim Rowland, & Eric Berger, to tour the WNYP. Left from the Railpace Picnic (nice but under attended due to the nasty rain that showed up) and headed to Binghamton., NY where we were to meet up with Nick. Thanks to US Scareways and other equally inept carriers, his flight was cancelled and was forced to fly to Scranton, PA...so we backtracked...only to find his luggage made it to Binghamton, NY.... Next time we know to book ourselves as checked baggage...it will always get there ahead of you. After dealing with this mess, we headed to Olean, NY and checked in with the WNYP railroad. I had provided them with a list of attendees in advance and they had releases waiting for us. After saying hi to the good people in Olean, headed west to intercept the Meadville Slingshot. The WNYP operatesa 3-day a week turn job called the Slingshot (should be called the Boomerang as it always returns to its origination!) 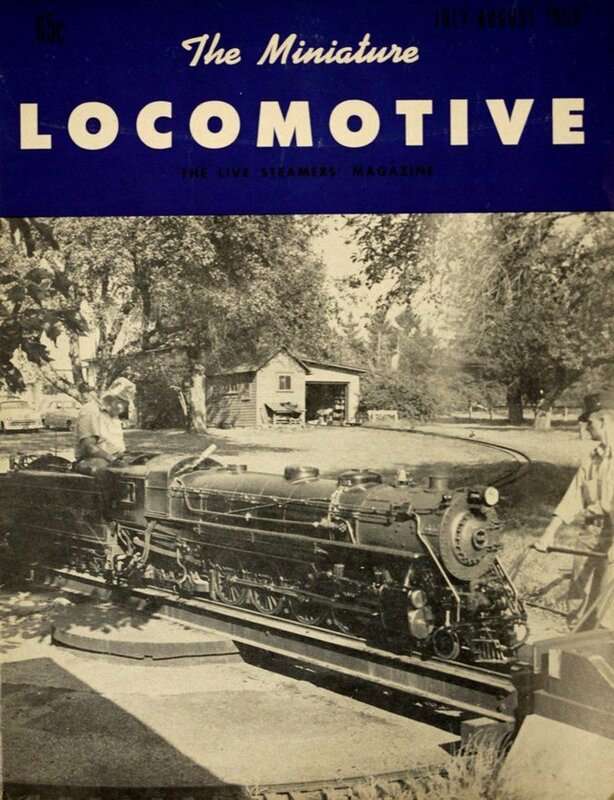 from both Olean and Meadville, usually meeting and exchanging trains in Falconer, NY. 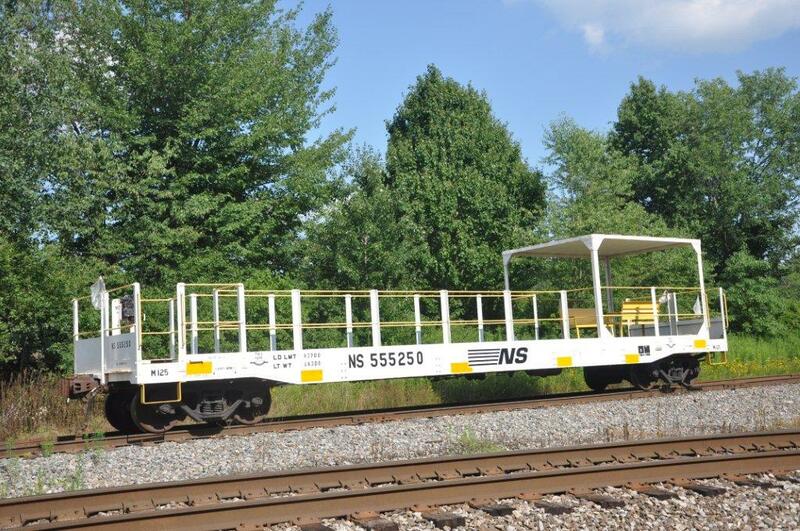 Today we found there was a westbound NS hopper train waiting at Columbus for the Meadville job. Made the meet with time to spare, then followed the Meadville train to Falconer, NY and back to Meadville, PA.
Tuesday was the day to chase the Oil City job. Engineer Chris Southwell put on a great show with the 426 from Sugar Creek to Oil City. Faced with the prospect of following a long hood low nosed unit back to Meadville, we opted to head for Greenville with my friend, Jon Clark, and hope to see some B&LE action. Not finding any, we set our sites on the NS local heading for Meadville and a coal train following it. Wednesday was time for the Slingshots to operate again. Followed the train east to Falconer and then picked up the Olean side with the C630 leading aC430!!! A SWEET combination!! Thursday was the Hornell Turn. Two C430's and a short train made for a quick-paced chase to Hornell and back. Friday we opted to visit the other regional carrier in the area and chased the B&P from Salamanca to Bradford, PA. Also shot the local switcher working in Bradford. The B&P is changing...and not for the better. They are becoming extremely railfan UN-friendly to the point of the local crew coming over to us at a PUBLIC grade crossing and threatening to call the police to have us arrested. The road crew made a number of references to us over the radio as damm thugs and goons. Oh well, another railroad down the tubes. Later that day we chased the WNYP's Farmer Valley job to Eldridge, PA before losing light. Due to a missed connection on Thursday, the WNYP ran an extra Hornell Turn on Saturday (usually a day of rest for the railroad with nothing scheduled).This was a chance to obtain different angles and locations along the line. We enjoyed the time spent on the railroad and came away with many excellent pictures. The management of the WNYP went the extra mile to ensure we had a pleasant time on the railroad and the crews and dispatchers really went out of their way to make our visit enjoyable. I have selected 52 images from this trip to showcase...Due to some people having dial-up accounts, I have uploaded them to my Facebook account and have provided a PUBLIC ACCESS link to allow viewing of the pix. If anyone has difficulty viewing the link, please let me know. Following article is from the Somerset County Freeholders. NEWARK – A North Jersey Transportation Planning Authority (NJTPA) study of issues at freight rail crossings throughout northern and central New Jersey has been recognized for transportation planning excellence by the U.S. Department of Transportation. The study received the 2010 Transportation Planning Excellence Award from the Federal Highway Administration and Federal Transit Administration. Somerset County Freeholder Peter S. Palmer, chairman and founder of the NJTPA’s Freight Initiatives Committee, accepted the award at the Transportation Research Board’s July meeting in Minneapolis. The NJTPA, with the help of consultants and a technical advisory committee, completed the two-phase study last year. 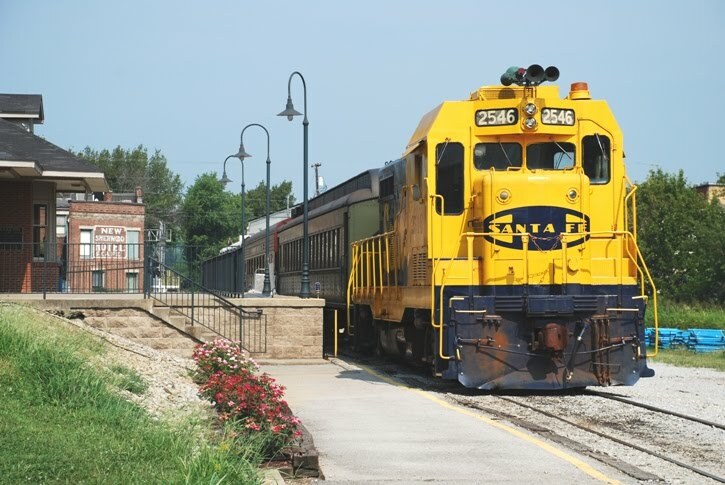 The effort came in response to projections of significant increases in regional freight rail traffic and anticipated impacts in communities where freight rail grade crossings are located. The study resulted in a prioritized list of rail crossings experiencing the highest impacts, along with a range of strategies and solutions for addressing these impacts. More than 90 award nominations were submitted for this year’s program, which is co-sponsored by the American Planning Association. After accepting the NJTPA’s top honor in the freight planning category, Freeholder Palmer participated in a forum highlighting award winners in all categories. My subject line say for this email states it all in a nutshell regarding my Saturday trackside trip to Lansdowne Junction (MP 58) on the Lehigh Line. I will say that NS 212 literally snuck up on me at 8:05. There was nothing picked up on my scanner of the signal at 58 being called. When the crossing gates started to sound off was the first and only notice I had of this train's approach. The motive power consisted of NS 9049, NS 9246 and NS 9430. There was also no mistaking what NS 65J's cargo consisted of when I got wind of it at 8:30. The pungent aroma of garbage being hauled west in the familiar blue containers by NS 9169 and NS 8356. That train couldn't go by fast enough past my location to suit me! Next eastbound train was a very long NS 22V with its colorful COFCs brought east by NS 2646 and NS 9905 at 9:20. The final train for me on this day would be NS 21M at 9:37. Motive power was NS 9553, NS 8955 and NS 9677. NORFOLK, VA. - Norfolk Southern's Automotive Distribution Group recently received two Automotive Quality Excellence Awards for outstanding service from the Association of American Railroads (AAR). The awards are based on rigorous, unannounced audits of rail-served automotive facilities throughout North America. Norfolk Southern won the Highest Quality Review Score for Destination Facilities by achieving a perfect score of 100 percent at its Titusville, Fla., automotive facility. This was the first perfect score ever given any facility since the AAR began its present audit program in 1997. Norfolk Southern also won the award for Greatest Overall Quality Review Score Improvement at Chrysler's Jefferson automotive ramp in Detroit. Norfolk Southern began operating this facility two years ago. In that time, the facility's score improved from 74 percent to 98.57 percent. 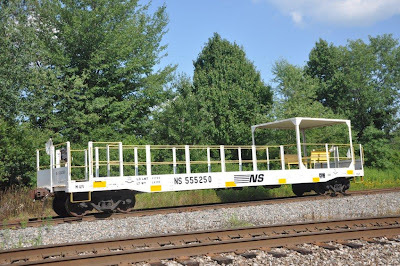 NORFOLK, VA. - Earlier this month, Norfolk Southern's Maintenance of Way and Structures Department completed $21 million in track, signal and bridge work in seven days on one if its primary coal lines in southwestern Pennsylvania. The Mon Line extends approximately 85 miles from Pittsburgh to coal mines in Washington and Greene counties. In 2009, almost 42 million tons of coal was transported over this rail line. Approximately 20 trains daily use the Mon Line. "Because the Mon Line is critical to Pennsylvania's coal industry, every year in early July we undertake an intensive effort to maintain and improve the rail infrastructure to ensure that the mines continue to receive consistent and reliable service," said Tim Drake, NS' vice president engineering. "It is a testament to the commitment of our employees that they are able to work under extreme conditions, during one of the hottest weather periods in recent years, safely and productively." Scheduled to coincide with the coal miners' annual summer break, between July 4 and July 10 nearly 600 NS engineering employees from across the railroad's 22-state system installed more than 56,000 crossties, laid almost 19 miles of new rail, rehabilitated and repaved 23 public at-grade railroad crossings, resurfaced the entire line, replaced one bridge and performed substantial work on two other bridges. Six work trains, along with more than 100 pieces of large machinery were utilized. Under normal curfew conditions it would take approximately three months to accomplish this work, with significant disruptions in service. 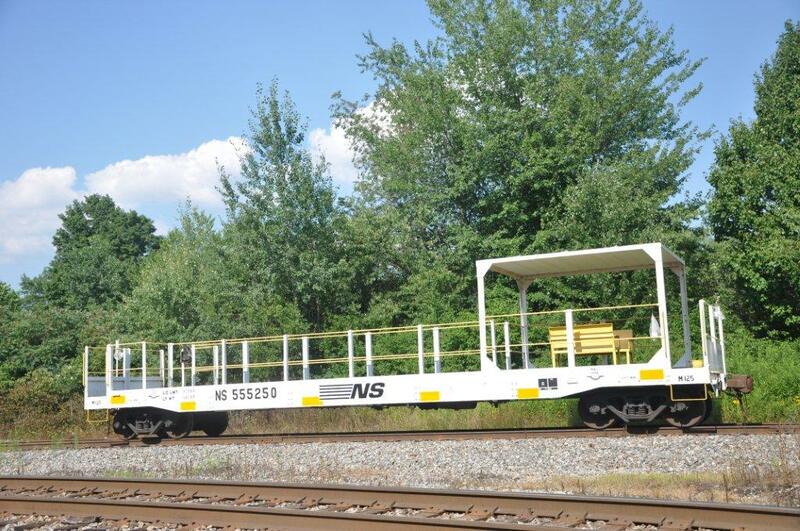 NS's newest addition to the Steam Excursion Train? Received the following via email from Kermit Geary, Jr. Text and photos are his. Does anyone have any idea what the purpose of this car is and how it would be used? 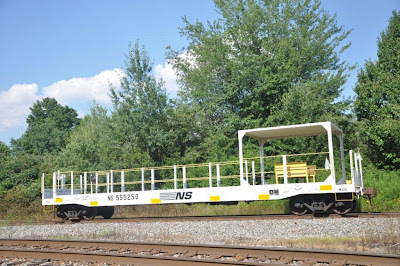 Came across this "observation car" today.....at Stoney Point, PA. The following is an Associated Press (AP) article from July 27, 2010, found on the web. It serves as preface to the following 3 postings which are email announcements from Norfolk Southern. NEW YORK (AP) -- Railroad Norfolk Southern Corp. said Tuesday that second-quarter earnings surged 59 percent, as shipments increased, prices rose and efficiency improved in the recovering economy. In another positive sign, the company said it's brought back nearly all the employees furloughed during the recession. It's also hiring some employees in areas where business is best. It still has about 8,000 rail cars in storage, compared with about 35,000 at the peak of the recession. "Looking ahead, while we share the common concerns about the ongoing strength of the recovery, our traffic levels remain strong," CEO Wick Moorman said. Norfolk Southern expects shipping volume improvements to remain steady throughout the year. Shipments jumped 22 percent in the second quarter, for a fourth straight quarter of volume growth. The Norfolk, Va., company earned $392 million, or $1.04 per share, compared with $247 million, or 66 cents per share a year earlier. Revenue rose 31 percent to $2.43 billion. Thomson Reuters says analysts forecast a profit of 99 cents per share on revenue of $2.40 billion. Moorman said he is "optimistic about continued year-over-year increases in rail traffic." Railroads are gauges of the nation's broader economic health because they carry a wide range of goods for consumers and businesses. Sales in Norfolk Southern's biggest category -- general merchandise -- which includes everything from lumber to cars, rose 31 percent to $1.3 billion. Revenue from shipments of coal, used to generate electricity and make steel, increased by 36 percent. The company predicts coal shipments for utilities, which is the bulk of the railroad's coal business, should improve as electricity consumption rises this year. Norfolk Southern also projects strong shipments of autos for the rest of the year, with new models from Ford and other vehicle manufacturers keeping demand strong. Also on Tuesday the company raised its dividend by 6 percent and said its board approved the repurchase of up to 50 million additional shares of its stock through 2014. The eastern railroad's rival, CSX Corp., reported second-quarter earnings earlier this month. It said a "dynamic" U.S. economy, combined with an improvement in shipping volume and higher prices, drove its profit up 36 percent. Norfolk Southern operates about 21,000 miles of rail in 22 states and the District of Columbia. In aftermarket trading Norfolk Southern shares fell 98 cents, almost 2 percent, to $55.54 after closing down 64 cents at $56.52 in the regular session. · Railway operating revenues increased 31 percent to $2.4 billion. · Income from railway operations improved 57 percent to $733 million. · Net income increased 59 percent to $392 million. · Diluted earnings per share rose 58 percent to $1.04. · The railway operating ratio improved by 5 percentage points to 69.8 percent, resulting in a second-quarter record. NORFOLK, VA. - Norfolk Southern Corporation today reported second-quarter 2010 net income of $392 million, an increase of 59 percent, compared with $247 million for second-quarter 2009. Diluted earnings per share were $1.04, up 58 percent, compared with $0.66 per diluted share earned in the second quarter of 2009. "Norfolk Southern delivered strong financial results in the second quarter, based on continuing operating leverage," said CEO Wick Moorman. "This is our fourth straight quarter of volume growth, and we are optimistic about continued year-over-year increases in rail traffic. We remain focused on reinforcing the safety and quality of our franchise, improving operational efficiency and service, and supporting future business growth." Second-quarter railway operating revenues improved 31 percent to $2.4 billion, compared with the second quarter of 2009, primarily as the result of a 22 percent increase in traffic volume. General merchandise revenues were $1.3 billion, 31 percent higher compared with second-quarter 2009 results. Coal revenues increased 36 percent to $696 million compared with the same period last year. Intermodal revenues were $451 million, 23 percent higher compared with the second quarter of 2009. Railway operating expenses for the quarter were $1.7 billion, 22 percent higher compared with the same period of 2009, primarily due to higher compensation and benefits, and fuel expenses. Income from railway operations improved 57 percent to $733 million in the second quarter compared with the same period last year. The railway operating ratio was 69.8, a second-quarter record, and an improvement of 5 percentage points compared with 74.8 percent during second-quarter 2009. NORFOLK, VA. - Norfolk Southern Corporation announced that its Board of Directors today voted to increase the regular quarterly dividend on the company's common stock by 6 percent, or 2 cents per share, from 34 to 36 cents per share. The increased dividend is payable on Sept. 10, to stockholders of record on Aug. 6. Since its inception in 1982, Norfolk Southern has paid dividends on its common stock for 112 consecutive quarters. 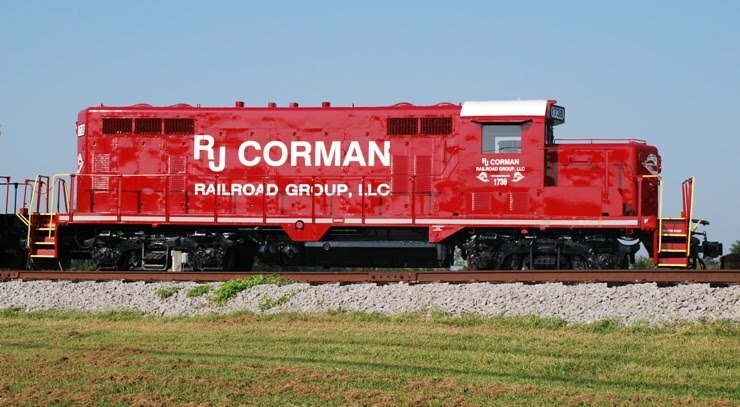 NORFOLK, VA. - Norfolk Southern Corporation today announced that its board of directors has authorized the repurchase of up to an additional 50 million shares of its common stock through Dec. 31, 2014. In combination with the previous share repurchase program that expires on Dec. 31, 2010, the total number of shares that may be repurchased has increased from 75 million to 125 million. From February 2006 through June 30, 2010, approximately 66.7 million shares have been repurchased for $3.4 billion. The timing and volume of any purchases will be guided by management's assessment of market conditions and other factors. Norfolk Southern had approximately 369 million shares outstanding as of June 30, 2010. Any statements contained in this news release which are not related to historical facts are forward-looking statements as that term is defined in the Private Securities Reform Act of 1995. Such forward-looking statements are subject to risks and uncertainties (noted in the corporation's filings with the SEC) which could cause actual results to differ.